SINGAPORE (Feb 2): Emerging Asian currencies advanced against the US dollar on Thursday after the US Federal Reserve stuck to its mildly upbeat economic view but gave no hint on rate hikes. The Taiwan dollar rose to its highest level since July 2015 at 31.10 per US dollar at one point, as onshore trade resumed after a holiday break, taking a cue from the greenback's drop over the Lunar New Year holidays. The South Korean won rose 1% and touched a high of 1,146.1 per US dollar, the won's strongest level since November. After the won's rise, a South Korean government official in charge of foreign exchange markets said authorities were closely monitoring currency markets and warning traders against pushing the won too high. The Taiwan dollar and South Korean won have been benefiting from positive economic fundamentals such as a recent pick-up in Taiwanese and South Korean exports, said Masashi Murata, currency strategist for Brown Brothers Harriman in Tokyo. In the case of the won, the outlook for South Korea's monetary policy also looks supportive, after data on Thursday showed an acceleration in inflation, Murata said. "It doesn't seem like South Korea's central bank will be cutting interest rates," he said. South Korean consumer prices rose at their fastest pace in more than four years in January, meeting the central bank's inflation target for the first time since it was lowered last year and tempering calls for another cut in interest rates. Amid signs of an improvement in the global economy, the currencies of export-oriented countries such as South Korea and Taiwan could outperform against the currencies of domestic-demand driven economies such as the Philippines, Indonesia and India in the near term, Murata added. 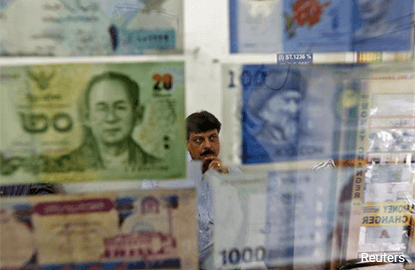 Elsewhere, the Thai baht rose to as high as 35.06, its highest level since Nov. 10. The baht has been supported recently by inflows into Thai bonds and US dollar-selling by local exporters. The gains in Asian currencies came after the US Federal Reserve held interest rates steady on Wednesday in its first meeting since President Donald Trump took office. While painting a relatively upbeat picture of the US economy, its statement gave no firm signal on the timing of its next rate move as Fed policymakers are still awaiting clarity on the possible impact of Trump's economic policies. "The FOMC statement was a non-event, as most investors had anticipated. Perhaps the only new information was the lack of a hawkish signal that would increase the probability of a March rate hike," Citi analysts said in a research note. * Onshore trading in the Taiwan dollar re-opened after being closed from Jan 27 to Feb 1 for the Lunar New Year holiday.